Home / News / Regal Robot is coming to Star Wars Celebration Chicago! 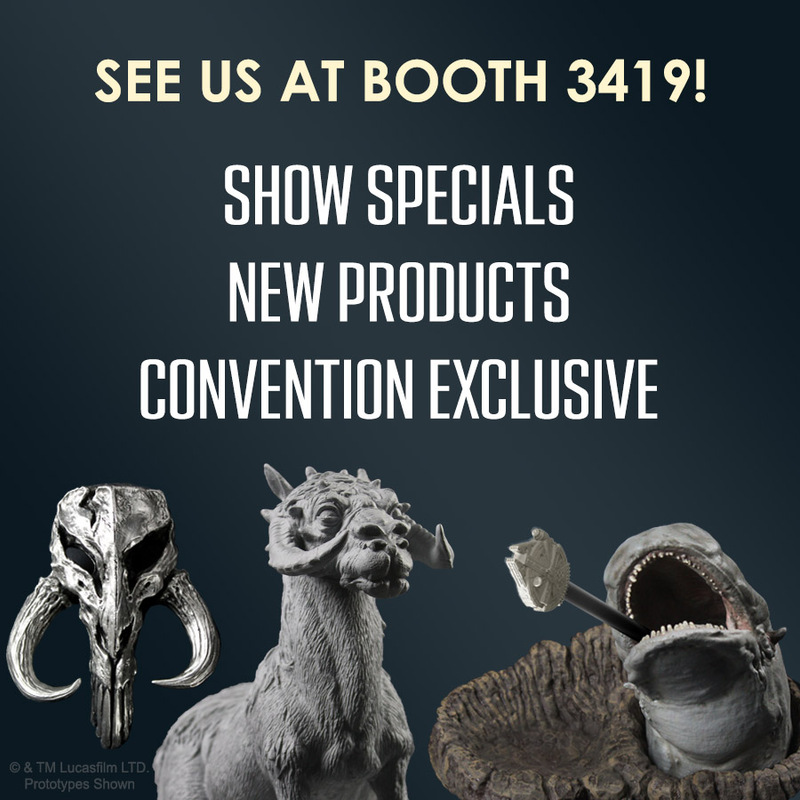 Come see Regal Robot at Booth #3419 at Star Wars Celebration Chicago! At our debut at Celebration Orlando, Regal Robot’s unique style of sculpture and furniture was unleashed upon Star Wars™ fans from around the world! This April, at Star Wars Celebration Chicago, we’re preparing an all-new booth with new products, a convention exclusive and even several show specials so fans at the show can save on some of our exciting creations! We’ll have people’s first opportunity to see in person (and order!) our Tauntaun Maquette Replica: Phil Tippett Signature Edition and Life-sized Chewbacca bust from our new Custom Character Studio. We’ll also have the Space Slug Desk Organizer which we announced at San Diego Comic Con a few months back, and we’ll even have a new convention exclusive, the Jabba’s Dais Gargoyle Magnet, scroll down for a pic! Another new furniture piece we’ll have at booth 3419 is our upcoming Emperor Throne inspired EXECUTIVE DESK CHAIR! This resized and rolling version of our plush Emperor Throne Armchair will give fans a chance to see just how comfy it can be to work on the dark side! We’ll have our cafe tables and director chairs on site, and for our Fett fans, we’ll have a supply of our various Mandalorian Skulls! Han Solo™ fans can purchase our Carbonite Wall Plaques and for items we don’t have at the show, or if something is too big for you to carry home, we’ll also be taking orders on certain items for home delivery. See us at Star Wars Celebration in Chicago at booth 3419! We are planning some incredible convention exclusive deals! Our celebration special offers will only apply to purchases made at the convention and are considered “while supplies last.” Come see us early for your best shot to grab these great deals! Our company founder, Tom Spina, will once again be speaking at several panels during the show. Look for him at the Collecting Movie Props and Costumes Panel (Sunday 6pm-7pm, Collector Stage) and the Star Wars Collectibles Update panel (Friday 1:30 to 2:30, Twin Suns Stage) where he’ll be talking about some of the other exciting projects we have going for 2019 and beyond. He’ll also be hosting the latest version of his famed “Behind the Scenes of the Cantina” panel (Sunday 1pm-2pm, Twin Suns Stage) which is not to be missed! If you’re going to be at the show, please stop by our booth (#3419) or one of Tom’s panels and say hello! We can’t wait to catch up with old friends and new, and look forward to seeing many of you there! And don’t forget to follow @RegalRobot on social media to learn more as the show gets closer and keep up with all the fun! 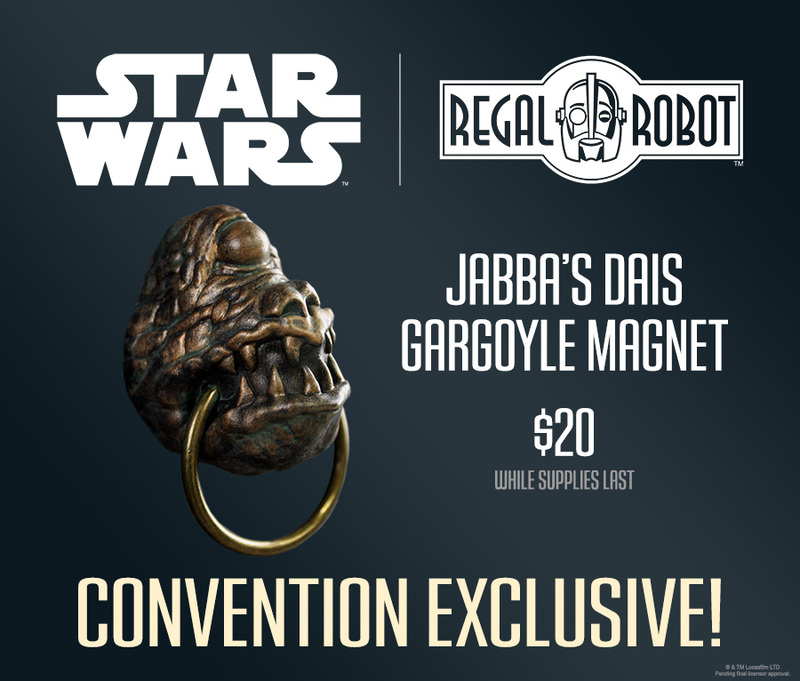 Our convention exclusive for 2019 is an approximately 3″ tall (including the ring) magnet based on the gargoyles in Jabba’s palace!